On a dark, damp afternoon at Aker Yards in Turku, Finland, two buses loaded with Royal Caribbean cruise executives, top-earning travel agents and international press, descended a narrow, crudely built tunnel, emerging into an expansive dry-dock area below. There, suspended by a towering crane -- reputed to be among the largest in the world -- was a 570-ton hull portion of Royal Caribbean's 220,000-ton, 5,400-passenger Genesis 1, already one of the most talked-about new-builds in cruising. It will be the world's largest cruise vessel when it enters service at the end of 2009. The stern of a nearly completed Independence of the Seas, the third Freedom-class vessel, hovered behind; its imposing size (it and its siblings currently hold the world's-largest title) was a stark contrast to the simple piece of metal hanging before us. We've gathered here today to witness Genesis' "keel laying" -- the lowering of a part of a vessel's central structural base onto support blocks. 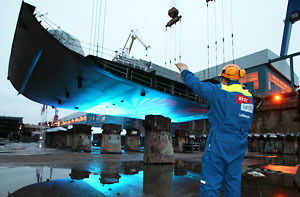 A long-running tradition in shipbuilding, the keel laying is a symbolic ceremony, the commemoration of a major milestone in a ship's construction. Following a short introduction and a festive offering from the Finnish Naval Band ("Fanfare for Genesis," they told us), the ceremonious task was underway. 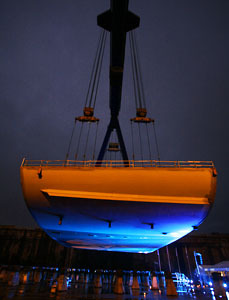 The 47-meter-wide keel was slowly lowered onto its support columns. The crowd applauded appreciatively, there was much handshaking, and the band played once more. The keel will actually be repositioned a day later with the aid of laser guidance to assure it's situated perfectly -- what we saw was in fact mostly for show. It is also traditional gesture of good luck to affix coins to the keel and indeed, Royal Caribbean Chairman and CEO Richard Fain, Royal Caribbean President Adam Goldstein, Aker Yards President Juha Heikinheimo and Aker Yards Turku Director Jykri Heinamaa were among the big wigs to place five or six "official" coins -- a euro coin and currencies from the U.S., U.K. and Sweden, among other countries -- underneath it. Though the coins are sometimes welded on, in this case they were simply placed underneath; they'll be removed later on in construction and put into a sealed box, which in turn will be attached to the hull. Then, as a final touch, attendees were asked to voluntarily place their own lucky coins -- which we hand-crafted ourselves earlier in the day between two pieces of metal in an old-fashioned minter -- under the keel as well. The next milestone occurs approximately one year from now when Genesis' dry dock is flooded and the ship floats -- hopefully -- for the first time. And in less than two years time, following the attachment of thousands of additional parts, many of which could be seen scattered around Akers Yard, Royal Caribbean's first Genesis-class vessel will be ready for launch, becoming the world's largest cruise vessel. It is also the first cruise ship to cost in excess of $1 billion dollars. With temperatures in the mid-thirties, the day wasn't especially chilly for Finland in December, and puddles (not ice) lay about, evidence of earlier rain. In stark contrast, the mood was spirited, but it was the damp, foggy weather that seemed to create a scene more akin to the stoney secrecy of Project Genesis. Paraphrasing Goldstein, the line has found that not saying anything at all about the project is the most effective means of getting people to talk about the project. Few details have surfaced so far on what will actually be onboard the ship. After all, we learned that all parties privy to any of Genesis' innovations (shipyard workers and RCI execs like Goldstein) have signed NOA's -- non disclosure agreements in sales-speak. Fittingly, everyone else is talking. Speculation has ranged from the bizarre (onboard plastic surgery) to the more reasonable (flight simulators) to the mundane (two FlowRiders rather than the one already on the Freedom-class trio). A director at the shipyard did tell us that said onboard innovations, whatever they may be, are already under construction. The naming of Genesis 1 and 2 is likely to take place in May of 2008. One thing we've learned: According to Royal Caribbean representatives, neither ship will be called Genesis of the Seas. Revelations on itineraries will also appear at around the middle of next year. Both Genesis ships will homeport in Ft. Lauderdale's Port Everglades for at minimum their first year of service. An RCI spokesman tells us that as of now, no ports are prepared to handle Genesis -- both in terms of increased passenger load and needed port infrastructure. A new Jamaican cruise port, Falmouth, is being constructed to accommodate the coming RCI beasts. The port is one of at least six ready to accommodate the Genesis vessels in the Eastern and Western Caribbean when the ships launch. Stay tuned in the coming months as more details trickle in. And send us your own ideas on what Genesis should or will have. Send your e-mails to dan@cruisecritic.com.